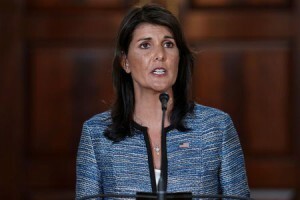 US Ambassador to the United Nations Nikki Haley accused Moscow on Thursday of seeking to cover up breaches of UN sanctions on North Korea by Russians after it pushed for changes to an independent report on sanctions violations. The report, submitted to the Security Council’s North Korea sanctions committee last month, said Pyongyang had not stopped its nuclear and missile programmes and was violating UN sanctions on exports. Russia and China have suggested the Security Council discuss easing sanctions after US President Donald Trump and North Korean leader Kim Jong Un met in June and Kim pledged to work toward denuclearisation.